Branched Polyethylenimine, Mw 70,000, 30% w/v aq. soln. (bPEI 70000 30% soln.) 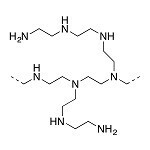 is highly branched polyamine with high cationic charge density. bPEI 70000 contains primary, secondary, and tertiary amine groups in approximately 25/50/25 ratio. Water, lower alcohols, glycols and THF.